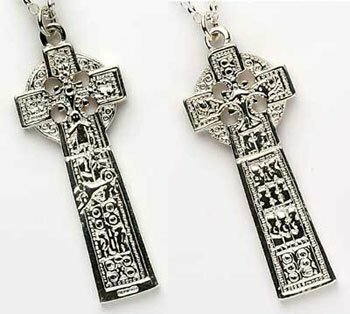 Beautiful Celtic Cross Pendant handmade in sterling silver faithfully captures all authentic detail of the original Celtic cross found at the monastery of Drumcliffe. 43mm high and 17mm wide. 8g silver weight. 10.2g gold weight. With 18″ chain. "Beloved to my heart also in the West Drumcliffe, at Culcinne’s Strand." including Derry, near his own birthplace Durrow and Kells. there as a sign of his love. as Scripture scenes. These are represented by both figures and symbolic designs. a cold eye, On life, on death, Horseman, pass by."